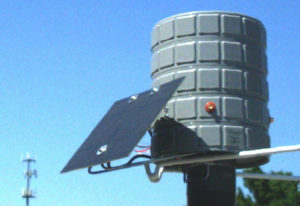 The ultimate system in tank-monitoring versatility and capability — our premier product. 9175 — The Stack — shown with optional external antenna for communication with other nearby Level Devil tank monitors. 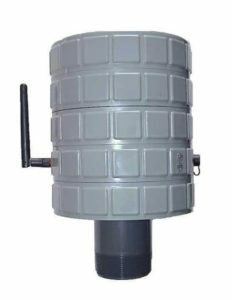 The Stack™ (ESI Model 9175) — our most popular and versatile system — is a modular, wired or wireless tank-monitor designed to meet your single-tank or multi-tank monitoring needs, with the maximum range of possible options and features. The Stack reports tank levels using almost any communication option imaginable: cellular, satellite, landline, serial wire, Ethernet or local RF/WiFi. Local display and alarms are also available. Most units use the popular SMS (Small Message Service) technology of the digital cellular phone infrastructure, and we are developing a new version that offers advanced LTE M1 communications. While data from The Stack can also be received via the Internet or telephone landline, the only device required for you to receive data is an ordinary cellular phone with SMS service — allowing you to to setup and acquire data from nearly anywhere. 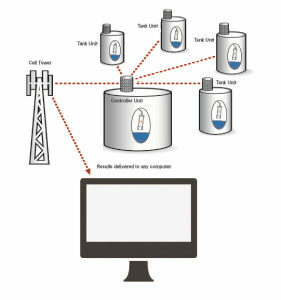 The Stack can monitor from 1 to 99 tanks (using lower-cost secondary monitor units on the additional tanks), and is available with a wide array of sensor modules to detect almost any kind of fluid imaginable. Available with battery, solar and/or AC power modules. If you have a remote-monitoring need, The Stack™ —the most versatile instrument in remote monitoring—can probably handle the task. This multi-tank monitoring solution is ideal for the following applications: multi-tank tank farms, remote locations, distillates, fuels, cryogenics and chemicals, with tank heights of 1 to 50 feet. But the exceptional versatility of The Stack allows its use with virtually ANY industry-standard 4-20 milliAmp or 0-5 volt sensor, including flow and temperature sensors, switches and mechanical gauges, and more. The Stack offers inventory monitoring capabilities from any internet-enabled device. Includes the ability for delivery scheduling, shrink control, operational optimization, and EPA compliance. This multi-tank monitoring solution can also reduce the cost of running your operation through reduced need for manpower and improved safety. The Stack is built as a stack of modules, one for each major function of the unit. Each module is available in a variety for types, to custom-fit to your application. The Stack “wakes up” several times each day to perform a variety of programmable checks, and (if instructed to) will transmit a message. Celluar for efficient communication through major cellular telecom providers. Landline for access through traditional wire telecom, especially in areas without cellular service. Satellite for access from exceptionally remote areas. Ethernet for direct connection to your computer network. Local RF / WiFi for local connection to your computer network. Serial / RS-232 for direct connection to your computer and many digital devices. Battery for independent power; long-life or rechargeable options. AC to provide reliable power, especially in high-volume use; also can recharge battery. Solar to provide extra power independent of the AC power grid; can recharge battery. schedules transmissions, responds to communications, triggers alarms. programmable to your custom specifications and requirements. Although The Stack can accommodate a wide rage of sensor inputs, a typical configuration incudes a liquid-pressure sensor connected to the main body of The Stack using a nylon tube. The main body is commonly intalled with a large nylon pipe-fitting tube on its base, which screws into a 2-inch NPT opening located on top of a liquid storage tank. 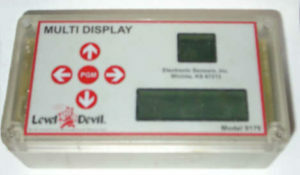 A local display option, showing your data in large, durable liquid-crystal digits. Download a pdf of the specification here.